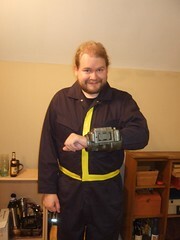 Last minute costume after getting the Survival Edition of Fallout 3 - Vault-Tec jumpsuit! Called graye to confirm which number should go on the back. 13, 69, or 101? He insisted I go with 13, which I did. And now all I can think of is getting some big burly muscle man to get make-up'd like a super mutant, carry a big gun, and be wearing a ripped, torn and stretched Mariposa Military Base uniform. Hells yeah. Though I think a ghoul is more Halloween-ey. Ghoul's gotta have a tree with fruit, of course. Something tells me that even some of the most seasoned Fallout fans will instinctively default to "Oh you're a zombie/ghoul" and not actually get the Harold reference. I need me some Vault Boy icons, I think. I take it you like the game then. From what little I've played, yeah. The man from the Vault! Quickly, hide your wimmens and stash your bottlecaps! Fable II thought it had a grip on my soul - until Fallout 3 moved in, put the pimp slap on it, and put me on the corner. One night of Fable 2, and now Fallout 3's likewise taken over. This weekend jedimentat's staying with me. I intend to set her up with Fable, and stick to Fallout myself. Exactly. Its pretty sad for Fable 2. Fable 2 has its good spots - some are definitely awesome. But I made 800k in 1 hour of RL life, and am now a petty god-king landlord. Well, am going to be, once I log back in and start actually buying up all the houses in the WORLD! However, Fallout 3 I am simply a wastelands wandering ammo-whore. Fallout 3 has had the same effect as happened to me with Oblivion. I find myself not playing for minutes at a time because I'm too fascinated by watching the night sky. I do have one nit to pick with it currently - I can't climb enough of the ruined skyscrapers and simply perch on them like some misshapen, ammo-laden gargoyle while my dog yaps excitedly below. don't have one yet. don't I need to buy LIVE to get one? Nope. Silver's free, and you can get that just from Fallout 3 on teh PC. That's how graye is on it.